I acquired Sunless Sea by impulse as soon as I heard it was a “story-driven roguelike”. I had heard of it before as a “lovecraftian ship navigation simulator”. So happens it attempts to be both, and executes its proposal with laudable competence. 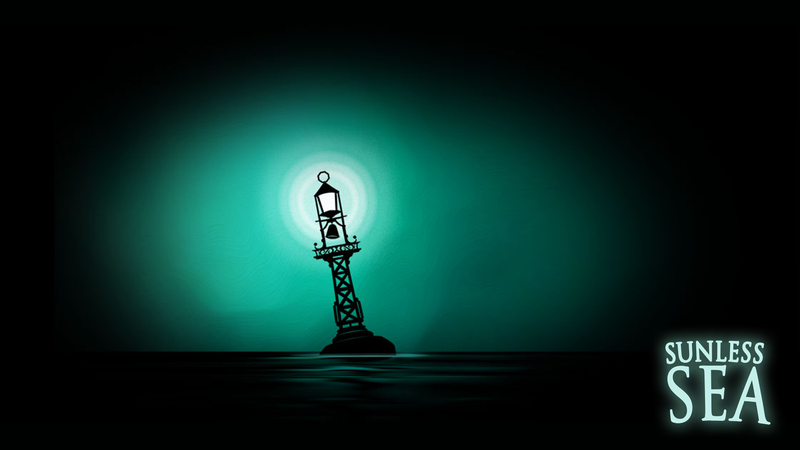 Sunless Sea is Uncharted Waters: New Horizons for the SNES meets Eternal Darkness for the Gamecube. It is Sid Meier’s Pirates with a Doctor Who, wacky kind of horror, eldritch and horrifying in its own right. It is fantastic, and scary and fascinating. 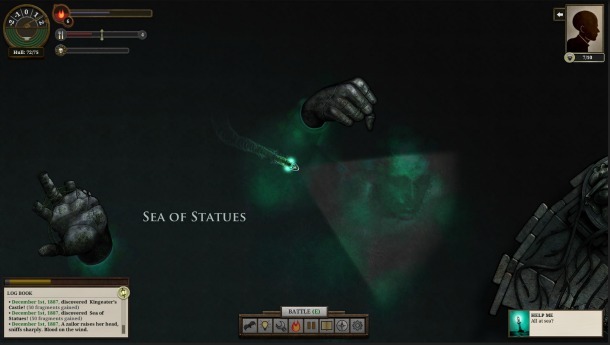 Sunless Sea evokes the mysteriousness of the oceans during the age of discoveries and displaces it into a fantasy, steampunk, victorian London to create a setting appropriately unknown. Your home port of Fallen London (Which as it implies, is London after falling into the earth. Get with the program.) is the only mostly safe place in the underground sea referred to as the Unterzee. As soon as you set sail from Fallen London, there’s no telling what you’ll find, with bat swarms, giant crabs and rat pirates being some of the most tame enemies you’ll encounter. The Unterzee is appropriately feared by those that dwell in it, and your own terror is only one of the things you must manage, lest despair drives you into joining the ghosts in the sea. Mind you, this is not a metaphor, there are actual sea ghosts who, on occasion, wail for you to join them. Your ship’s light brings some comfort at the cost of precious fuel. You must balance the intake of fear with the diminishing fuel and food supplies. It is a game of management. as well as exploration. But most of all, it’s story-driven. There is no single story to speak, but all of them are superbly written. You travel from port to port, from tale to tale, every one of them as eerie as the previous and never the same as any other. The seas are ruled by the gods of Salt, of Stone and of Storm, and you seek their favour, only hoping not to displease any of them. Spider-silk and mushroom wine are common trading goods, while human souls and uncensored romantic novels are illegal commodities. Every island you visit is a story. Every game update is a new set of stories added. It is a fascinating, ever expanding world for the fantasy and horror writer and all its consumers. If I had to describe Sunless Sea in one word, it would be “enigmatic”. More extensively I’d describe it as dashingly green and black. But it offers too much content; it’s too original to be summarized so briefly. As a roguelike, it is unconventional. As a horror story, it is promising, and as an indie game as a whole it is very successful. I can only hope the Unterzee becomes richer and richer with its programmed updates, and so should you.